I just adore these quotes. For those who are conscious of the moon’s effect on our energies, be honest; when things are going wrong, how many times have you blamed the moon? Don’t you just love how we blame astrology? I recently posted about the planets on my Instagram after the mercury retrograde had ended - “Mercury is finally out of retrograde (so now everything is your own fault again)!” I love how we do that! Whilst it’s a bit ‘tongue in cheek’ because it’s easy to blame the external (and, really, I believe it’s an inside-out world which means that everything is our own creation), I do believe that there is something in the moon cycle ‘stuff;’ I feel it! To connect with the moon, we first need to become aware of the lunar cycle; there are eight phases the moon goes through in each month, and we see the moon change according to her position in relation to the Sun and the Earth’s changes. Generally, the New Moon is a yin time, and the Full Moon is a yang time, and so, to celebrate this energy, there are different rituals for each phase to create balance. Firstly, let’s understand about each phase. The New Moon - On August 11th, we have a Super New Moon. A New Moon phase of the cycle is a great time to begin working with the moon because it is a time of a fresh new start. In this particular moon phase, it is time to sow the seeds for what you want in your future and set intentions for your dreams. It is a time of potential and imaginings – and this is perhaps the most exciting part of the cycle! You might notice an increase in ideas, creativity and inspiration during this time, and so it is a good time to think about what you want to do. Waxing Crescent - 3-7 days after the New Moon is the Waxing Crescent stage. This stage is about exploring your dreams and moving forward. It is about trust and self-courage. The moon is moving from being an invisible idea to coming into its power, and this is the same for you. Cultivate faith in yourself during this time. First Quarter Moon - 7-10 days after the New Moon is the First Quarter. This is a time of commitment and confidence. The moon in this phase looks like a half moon, in between New and Full. You might begin to feel a dip in confidence, and so it is nice to do a ritual to support this. It’s also a time of letting go of anything that perhaps doesn’t serve you; including ego. Gibbon Moon - In the Gibbon Moon phase, which is 10-15 days after New Moon, it is about having the strength to keep walking your path. Don’t give up because there is so much potential! Full Moon - Here we are at Full Moon! This is where the energy changes to a more ‘fiery’ yang energy - now is the time to allow action to happen with whatever you are planning. Do you ever notice you struggle to sleep at this time of the month? It’s because the energy is so high, and we are able to work with this to achieve our goals and potential! 15-18 days after the New Moon, this phase is about results, but it’s also about forgiveness and gratitude. This moon phase is a good time to check in with how you feel, but also not to beat yourself up. The high energy can feel anxious, and emotional, so we can also use this phase to let go of this pent-up feeling, especially if we have not yet achieved what we are aiming for. Sometimes our dreams are longer-term and so we can use this time to be grateful for where we are now and how far forward this cycle has helped to get us. Disseminating Moon - 3-7 days after Full Moon, the Disseminating phase begins. This is about acceptance and relaxing back into the knowledge that we are always in a cycle. It follows an intensely emotional period, and so this is a time to breathe and let go of that emotion. This time is a good time to relax and restore, allowing life to flow. During this phase, it’s not the time to start something new, but to restore ready for the next cycle. Celebrate the wisdom you gained in this phase, and allow yourself to flow towards the next phase. Third Quarter Moon - This stage of the cycle happens about 7-10 days after the Full Moon and it’s about re-balancing and evaluating what you have learned. It’s about acceptance and adjusting to make way for the new – letting go of anything that doesn’t serve us. This phase is about making decisions about what you want to keep hold of and let go of. Balsamic Moon - The final stage is about releasing and healing. 10 days after the Full Moon, until the next New Moon, this phase is about complete surrender. This is a time to soothe, regenerate and restore ready to begin the next cycle of activity again. It is often advised that we can help harness the energy with moon rituals to remind us of where we are meant to be. Having learned a little about the various stages, why not have a go at some of these rituals to support you through the moon’s energies this month? Beginning with August’s New Moon, enjoy trying our aromatic aromatherapy rituals to help you work with the moon this month! Aromatic Sage cleanse ritual – to allow yourself space for creative ideas to come up, set the tone with your aromatherapy diffuser. Blend 3 drops Tangerine essential oil, 2 drops Lemon and 2 drops Frankincense and then cleanse yourself and your room with herbal incense like Sage. Meditate and chant mantras – whilst that is burning away, make use of this space by meditating on your intentions for the future, perhaps chanting the mantra ‘Om’ to remind yourself you are always connected. Allow ideas to come into your head and enjoy following the nice feelings associated with them. Write out intentions – as ideas pop up, write them down. Use them to journal about intentions you want to achieve this month. Have an aromatherapy bath – finally, after all that creative energy has been cultivated, harness it by nurturing yourself in a bath of essential oils to stoke the fire of the imagination with warmth! Mix 15ml Bath Oil with 2 drops Lavender, 2 drops Clary Sage and 2 drops Jasmine and relax back to let your mind settle. Often, when your mind settles, you might find even more creative insight appears! Create a confidence spritz - have on hand a courage spritz to spray over yourself at any point you need a reminder that you’ve got this! For inspired faith, add 15 drops of Sweet Orange essential oil, 10 drops of Cedarwood, and 5 drops Cypress into a 100ml spray bottle filled with Lavender Hydrolat or water, and spray as necessary. Visualise your intentions - as you use the spritz, make some comfortable space each day to sit and feel the nice feeling associated with your feelings. However, remember that all you need is already within; there is nothing you have to ‘do’ but trust yourself! You are exactly where you need to be. Diffuse some ‘letting go’ and ‘commitment’ essential oils – this is a really nice time to just let go and trust yourself. Add 3 drops Rose, 2 drops Patchouli and 1 drop Lemon to your aromatherapy diffuser to encourage feelings of focus, whilst allowing release of tension. Sit and meditate on your intentions and write out any blocks that come up. Then, just let go of doing anything and allow yourself to flow. Trust that the wisdom is within. Create a ‘determination and strength’ aromatherapy massage blend - add 2 drops Rosemary, 2 drops Peppermint and 2 drops Lavender to 15ml Grapeseed oil and smother over your body, in the direction towards the heart, to help you feel invigorated. Use this to connect to your inner strength, review what is and isn’t working, make tweaks, and come up with alternative plans if you want to! Diffuse 3 drops Rosemary essential oil and 3 drops Lemon in an aromatherapy diffuser – this blend will really encourage you to keep going right into the Full Moon! Do some yang yoga – this part of the cycle demands strength and courage to take action, so a good way to support this is to embody it through some strong yoga practice. You can massage yourself with some lovely aromatherapy oils before doing this practice to balance you out: add 2 drops Sweet Orange, 2 drops Geranium, and 2 drops Ylang Ylang to 15ml Grapeseed oil and massage into the skin (in the direction of your heart) to help keep you calm whilst you take action. Wash your hands pre-practice and don't apply it to your feet to avoid yoga slippages! Diffuse essential oils to release any difficult emotions that come up – add 3 drops of beautiful Rose, 2 drops Bergamot and 1 drop Patchouli to your diffuser and allow yourself to breathe and feel your emotions. Journal about your feelings, about who you need to forgive and about gratitude – or just see what comes up out of your journaling. Let wisdom unfurl about who you really are and what you want. Breathe. Another cleanse – this might be a nice time to do another cleansing Aromatherapy sage ritual! Practice yin yoga – this is a slower, relaxed yoga, which encourages acceptance and relaxation into the flow of the cycle, focusing on the breath. To fully enjoy this ritual, add in essential oils – diffuse 3 drops Rose, 2 drops Geranium and 2 drops Lavender. Follow it up with some meditation. Remind yourself of acceptance – embody the epitome of relaxation by taking Lavender round with you and having a little sniff of the bottle every so often to remind yourself that this is the time to breathe and let go. You have it within you to let life flow; when you forget, just allow yourself the gentle reminder from the hug in a bottle! Have a massage – it really is time to relax in this phase, so book yourself a nice aromatherapy massage – or make an oil yourself to encourage deep relaxation! Try adding 2 drops Jasmine, 2 drops Lavender and 2 drops Ylang Ylang to 15ml Grapeseed oil and cocoon yourself in the floral scent before lying on the bed in peace and quiet for half an hour. Journal and diffuse essential oils – as you journal about what you need to let go of, and allow insights to drop into your head, diffuse an aromatherapy blend which will really allow you to detox from all that no longer serves you! Add 3 drops Grapefruit, 3 drops Juniperberry, and 1 drop Ravensara to your diffuser. Massage and chill – this is the time to totally switch off. Try to let any ‘overthinking’ about action pass, allowing yourself to rest. You are exactly where you need to be. A great blend for this is 3 drops Rose, 2 drops Chamomile and 1 drop Lavender mixed into 15ml of Grapeseed oil. Massage gently into the skin and allow yourself to enjoy the aromas as you lie in a comfy area. Meditative diffusion – it is nice to meditate, if you enjoy this, whilst diffusing a blend of 2 drops Frankincense, 2 drops Myrrh and 2 drops Sweet Orange. Ground yourself in the present, breathe, surrender to the moment. You are always exactly where you need to be. These aromatherapy rituals can really help you to feel reconnected to yourself and re-balanced, particularly if you feel you are affected by the moon cycles. It’s important to remember, though, that you are never not connected; you are always exactly where you need to be – moon or no moon! You might also find that you’re already very intuitive with working with the moon. 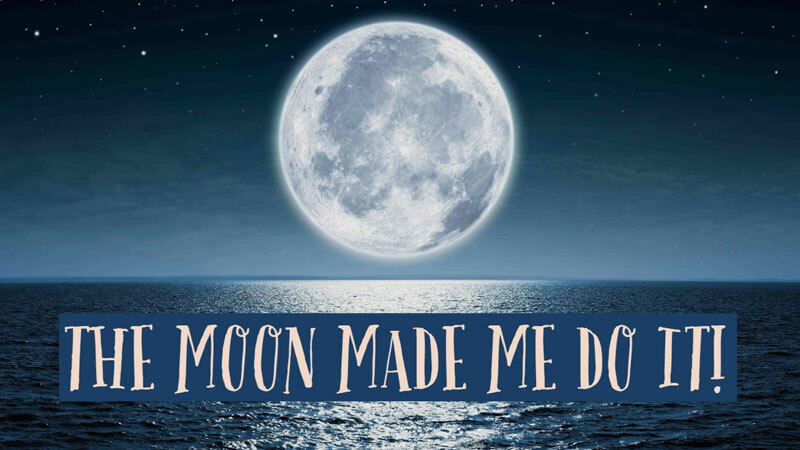 These rituals are great fun if you enjoy working with the natural moon phases; so, get your essential oils out, start on August 11th with your exciting plans, and see where the moon takes you!